include  Only load included categories. Accepts I18n categories keys. Order will be respected, except for the recent category which will always be the first. exclude  Don't load excluded categories. Accepts I18n categories keys. backgroundImageFn ((set, sheetSize) => …) A Fn that returns that image sheet to use for emojis. Useful for avoiding a request if you have the sheet locally. Sheets are served from unpkg, a global CDN that serves files published to npm. size ✓ The emoji width and height. backgroundImageFn ((set, sheetSize) => …) Fn that returns that image sheet to use for emojis. Useful for avoiding a request if you have the sheet locally. Certain sets don’t support all emojis (i.e. Messenger & Facebook don’t support :shrug:). By default the Emoji component will not render anything so that the emojis’ don’t take space in the picker when not available. When using the standalone Emoji component, you can however render anything you want by providing the fallback props. You can provide custom emojis which will show up in their own category. You can either use a single image as imageUrl or use a spritesheet as shown in the second object. The Picker doesn’t have to be mounted for you to take advantage of the advanced search results. By default EmojiMart will store user chosen skin and frequently used emojis in localStorage. Not only does Emoji Mart return more results than most emoji picker, they’re more accurate and sorted by relevance. 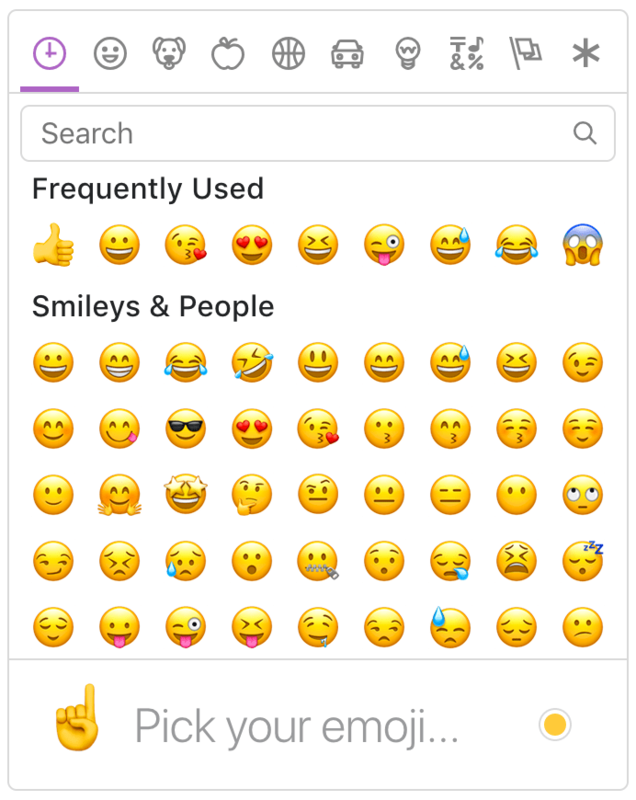 The only emoji picker that returns emojis when searching for emoticons. As the developer, you have control over which skin color is used by default. It can however be overwritten as per user preference.